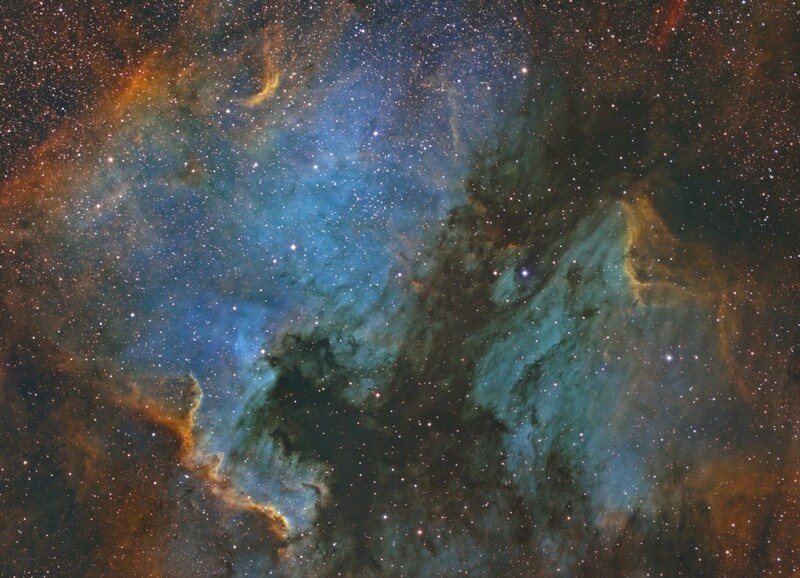 NGC 7000, commonly called the North America nebula, is a large emission nebula in the constellation Cygnus. Much of Cygnus has the Milky Way galaxy running through and it is a target rich environment. The North America nebula gets its name because it is shaped like the North American continent. It lies in the Orion arm of the Milky Way Galaxy. In my photo it is easy to see the shape of the Gulf of Mexico, Central America, Florida, and the entire US and Canada. The part that resembles Central America is called the Cygnus Wall and contains the largest star forming regions of the nebula. This area is rich in Hydrogen gas and dust and like most Hydrogen rich objects it appears red in LRGB imaging. I like the shape of the Cygnus Wall and how there appears to be a “wind” blowing dust away from the wall area. The dark area that forms the Gulf of Mexico is a dark dust cloud that spans past the Florida part of the nebula all the way to the Pelican Nebula. The source star that illuminates the entire nebula is located in this dark dust cloud and is down and to the right of the Florida part. 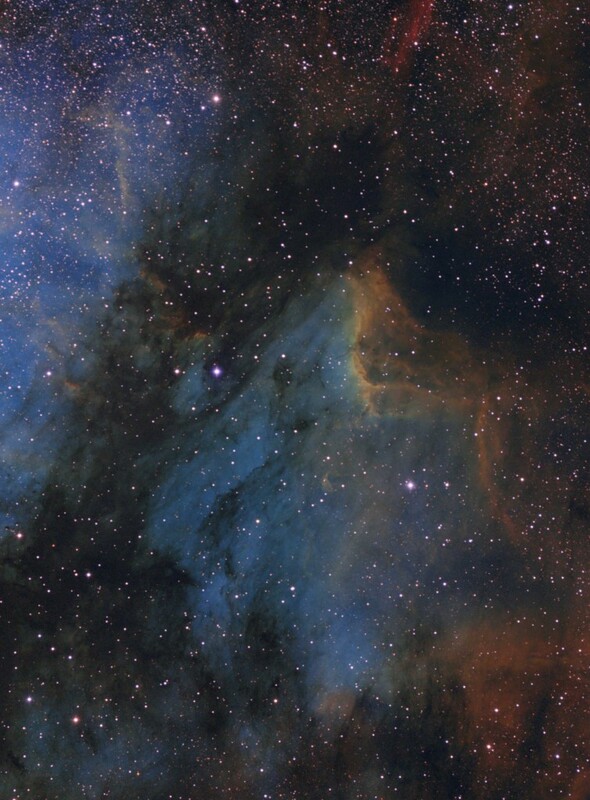 This star is also responsible for illuminating the nearby Pelican Nebula. It does not appear bright in the image but that is because of the dust that obscures our view. In the same dark nebula area you can see the asterism formed by seven stars that appears to look like the Orion nebula. Moving up the East Coast from Florida, I like the two parts of the dark nebula that would be where the Carolinas and Maine are located. They are illuminated from the side and have an eerie yellowish-orange color in narrowband. The Continental US and Canadian parts of the nebula are rich in stars and there is another wispy concentration of gas and dust in the Canadian part of the nebula. IC 5070, commonly called the Pelican Nebula, is a large emission nebula in the constellation of Cygnus. It is part of the North America nebula complex and is illuminated by the same source star. 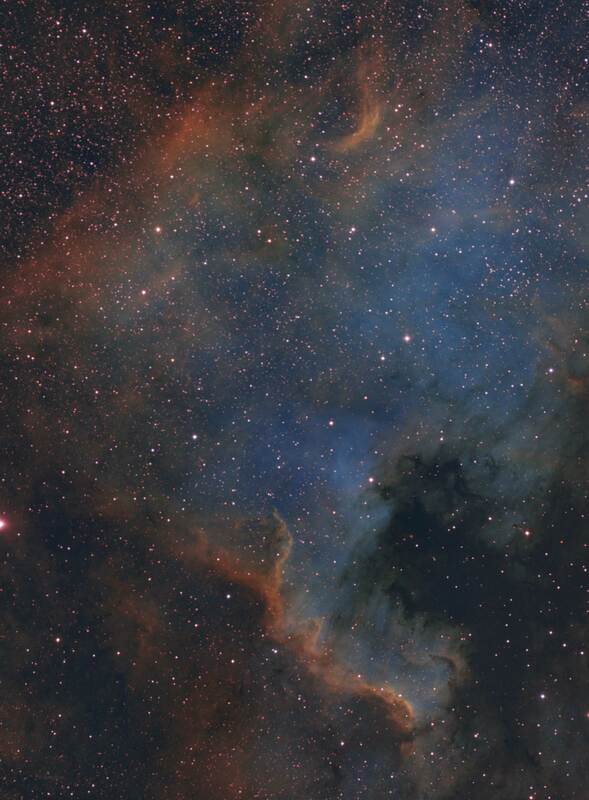 It resembles a pelican that appears to be looking at the North America Nebula. The distinct emission area along the neck and back area is known as IC 5067 and is a large star forming region. 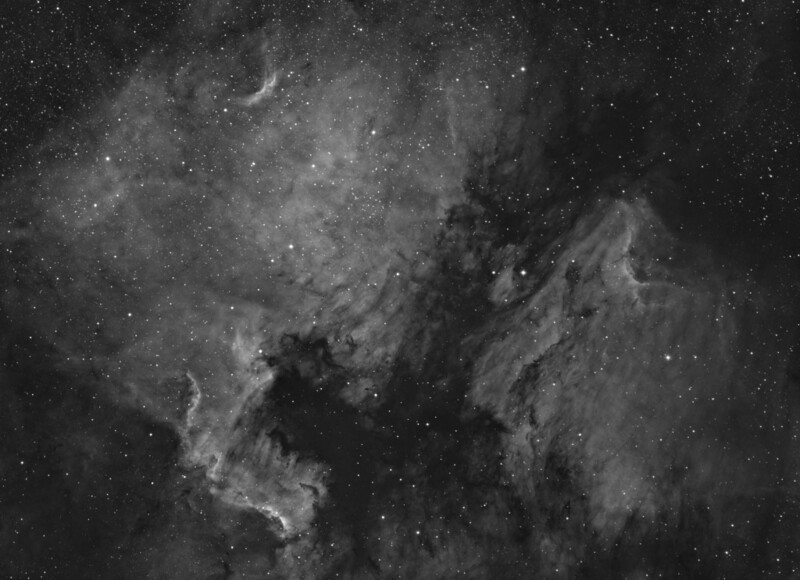 The large Dark nebula in between NGC 7000 and IC 5070 is LDN 935 and it helps shape the image of the Pelican and North America nebula. The Spitzer Space Telescope has looked in to this very dense dust cloud and found a lot of star formation. The same Spitzer Space Telescope has found 2076 YSO (Young Star Candidates) in the entire North America+ Pelican region.